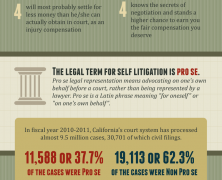 On this infographic you’ll find information about why attorney cost for business cases is particularly high and how attorneys’ fee is made up. Additionally, you can get an idea of average spending for the most common legal services requested by small businesses, as well as of salary variation based on specific location across the US. 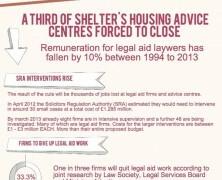 600.000 people in the UK are going to deprived of their right to legal advice and support from today 1st April 2013. This report highlights the changes being made to the legal aid system and raises questions about the societal effect of this measure. A quick reference guide in favor of negligence victims that rises awareness over the risks involved with self litigation choice, as a measure to cut legal service expenses, instead of hiring a law professional . A look over the average attorney salaries in 14 countries around the world along with analogic comparison against living cost in New York. More info less graphic but it’s ok if you are in the law tribe.